Blog of Nashville native, Jon Wright, with musings on web design, css, photoshop, iphones, rock operas, and other such things. I am delivering a presentation at the March 14th Drupal Camp Nashville entitled "Introduction to Theming: Converting a static HTML + CSS site template into a drupal theme." I love you even more, Cufon! Cufon is a fantastic way to embed fonts into your website, allowing you to not only move beyond the standard list of websafe fonts that we are all so incredibly bored with... but to present each and every font with crystal clear anti aliased edges. It's like embedding flash fonts in the page without the flash! And now I just discovered that you can use the cufon framework to add gradients and shadows to the text as well. Amazing. So I was finishing up a site built on drupal - doing all the little clean up activities in order to flip the site live. I ended up needing to upgrade a couple of modules, adjust the caching, and just generally making a bunch of little tweaks. I was just preparing my email to the client to give them the low down on the new site, when I noticed that the WYSIWYG toolbar was not showing up in the node BODY for any content type. As I was just about to walk the client through the site and explain how wonderfully easy and intuitive it was going to be to administrate their site content, the sudden loss of a WYSIWIG environment right at the 11th hour was a bummer. tags within the filtered HTML [admin/settings/filters/1/configure]), as well as configure the WYSIWG module settings (admin/settings/wysiwyg). Anyway - Somehow someway I had introduced a conflict into my site which was preventing the WYSIWYG toolbar from showing up. I spent then next 3 hours tweaking setting, enabling and disabling modules, and just trying to get the WYSIWYG toolbar to show up. I reinstalled that module, switched libraries... no dice. Finally, I was able to deduce that if I disabled the cufon module (http://drupal.org/project/cufon) the toolbar would come back. The thing is, the cufon module is totally awesome, and I was loathe to remove it from my site. So, I uninstalled and reinstalled and jumped though all of those hoops. I dug deep into all of the WYSIWG settings - and reinstalled that. Stranger still, I ended up looking at another site I had done and noticed that it was running the same versions fo WYSIWYG and CUFON and the same libraries - and that site was working! 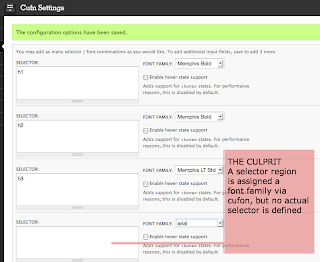 Finally, right as I was about to give up, I went back and looked at the CUFON settings and noticed one selector field that had a font assigned to an empty selector. I set that font back to "-----" and... SUCCESS. Anyway - hours out of my day on one stupid bit of carelessness. As my google searches in trying to rectify were totally fruitless, I hope this post may help people find a quicker solution to a small but frustrating problem. So I was just helping a friend set up a site for a 501c he is doing, and i decided to do it in drupal. Images will play a big part, so I set up a gallery using CCK, Imagecache, and lightbox. Within Imagecache, I setup 2 configuration: a small 100 x 100 scaled and cropped square for thumbnails which - when clicked - open up a zoom preset in a lightbox window. I had set my zoom preset to have a widht and height of 680px, with the understanding that the image would be resized so that the long edge was 680px, but the picture maintained aspect ratio. This was all fine and dandy for most images, but for a collection of images, the zoom preset just did not get produced. I would pop up the image and get a little error image not found logo in my pop up. The strange thing is that the original image was viewable in the node, and all of the other presets were working. I flushed imagecache a coupla times, which resulted in one of the 4 problem images resolving. Weird. Ultimately, I found that by limiting ONLY the width and leaving the height blank in the imagecache preset, I was able to get everything working. Unfortunately, that doesn't really solve the mystery. And now I think Pandora is kinda stupid. A month or so ago, my wife and I picked up a great docking station at Costco for our iPhones. For a coupla years, all music in the home had been relegated to computer, so if we were doing any cooking or house-cleaning or whatnot and we wanted some tunes, that involved firing up media jukebox, selecting a playlist, and blasting music from the office. A docking station let us quickly dial something in whilst in the kitchen or entertaining, and has proven wonderful. However, the next hurdle was what to listen to. I only have the 8GB iphone, and my carry-around playlist is pretty much my jogging playlist, and my wife can't tolerate Iron Maiden, so there is a rub. Enter Pandora. Several folks at the office had been using Pandora for a while, but as I had a 450 GB drive on my work computer filled to the brim with music I could organize into whatever playlist I was in the mood for, I never really saw the need to check it out. However, if my wife and I are fixing dinner and we want some quick tunes that we can both agree on, I don't wnat to take the time to build a playlist. Pandora is the perfect solution - pick an artist or genre, and Pandora makes a playlist for you on the fly - quick and easy. As I have become more accustomed to using Pandora, I have really enjoyed some of new music it has put in my playlists... it is a great discovery tool. To that end, if Pandora was hipping me to new music, I figured it might could hip other folks to my music.. and so began the exploration of how to submit to Pandora. Q: How do I submit my music (or my band's music) to be considered for inclusion on Pandora? We're very excited to announce a brand-new process to submit your music (or your band's music) to Pandora. So I jumped through the hoops. I established an Amazon reseller account and mailed in my CD to inventory, even though the CD was already available digitally via Amazon. Once completed, I walked through the Pandora submission. At the end, I was told my submission was pending. I did not get an email, I just had to remember to log in to http://submitmusic.pandora.com/submit/status every once in a while. I just don't know - a quick search yields no answers, just other frustrated rejects like myself: http://www.jamesclark.com/2009/11/21/pandora-has-closed-her-box/, http://parallel-rose.livejournal.com/13820.html. And the worst part is the lack of info. If I knew i had to get with an aggregator or work through another channel, I would check that out. But I don't know, I am just rejected. Not only is Pandora not helping me get my music discovered, it has left me rather despondent. I am closing in on my first box of photos to send off - I have approximately 250 more man-hours in this than originally anticipated. But that is how it always goes. I spent a full day, and Then my sister came over and helped me for a while, and then my wife and I spent another evening grouping things together. 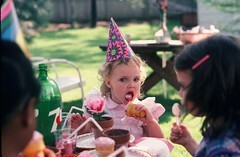 Kathleen now has a pretty good idea of how everyone in my family looked through the years. One of the problems has been that I didn't really stumble upon a good organization theme until late in the game. I was trying to group my mom's family, and then my dad's family, and trying to find some sort of event-type-theme: so putting all of thanksgiving together, or all of my sister's birthdays in one pile. Well, I have been trying to wrap my head around iPhoto at the same time, and in those computer machinations I realized that the only way to do it is the utterly-obvious-group-'em-by-year. Of course, this was complicated by some bad math on my part (my sister was born in 78, not 79), but I now have my stacks from 1973 onwards. I have also been searching if there is any viable solution other than ScanMyPhotos.com(SMP) - as my mom is not real cool with the idea of sending all of these irreplaceable photos in the mail across the country. I did find a place locally, but it is $1.00/scan vs. the ScanMyPhotos.com $0.05/scan. so that kinda seals the deal. And besides that, I got my initial batch back from ScanMyPhotos.com and they look great, and the turn around was super quick. 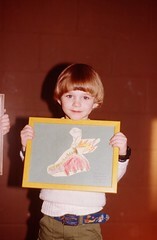 In the big photo box was a plastic bag with 50 or so slides. I was immediately psyched, as I actually own a working slide projector - but the lamp decided to blow out around 25 seconds into the experiment. So I sent 'em off to SMP te render them into something I could work with. SMP has two levels of scannin - 2000 dpi, and 4000 dpi. As I am not really sure what is on these, I electerd to go with 2000 which was cheaper and quicker. I figure if I really need higher res, I can do another batch down the road. The results are good. Not mind-blowingly awesome, but good. there are a coupla instances of weird color-artefacting, and some stuff is a little grainy. Of course, this may have more to do with the original source than anything. Overall, I am incredibly pleased with the price, quality, and turn-around. I know that there are a bunch more slides - particularly from my Dad's side of the family, and I hope this case study will convince my folks to let me send them off. Right now they are probably sitting above the garage and there is a slim chance they will ever be accessed in their current form, as I have dad's slide projector, and the bulb just blew out ;). 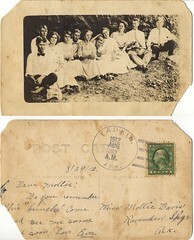 I can only imagine that this is the oldest photo in this collection that I am working with on my Great Big Photo Project - a picture postcard sent within Arkansas dated August 29, 1912! There is a note with the postcard in my Grandmother's handwriting that states "Front to back - First Date, Lee Davis, Eva Bowen, J.V. Looney (my great-grandfather), Mollie Davis (my great-grandmother), Will Bailey, Julie Bailey, Lora Davis, Lelia Davis, Lea Davis, George Looney, Elmer Davis (Eva made picture)"
So - I guess this means this documents the first date of my great-grandparents? How cool is that. I guess they really believed in the dating ladder - and starting with group dating. Clearly, as this was sent to Mollie Davis, this predates her getting married when she became Mollie Looney. I love that the address is a simple name, city, state. Ravenden Springs was never the largest of cities, I 'spose. This would have been sent in the 'golden age of picture postcards, before WWI, and before the telephone replaced them as a quicker way to communicate.